At the far end of Te Rauparaha Street is the picturesque Otaki Golf Club, looking green and immaculate despite this summer’s drought. How do they do it? I wondered. Club president Bella Ansell says it’s down to Course Superintendant Jamie Lamplough, his staff and his team of volunteers. Jamie has been with the club for a quarter of a century, and last year was rewarded with an environmental award for his work. From the look of the immaculate fairways and greens it was well-deserved. The course proper is undulating, easy walking but excellent exercise. It is not too long, each hole is distinctive and the course encourages good shot making, whether you are a high or low handicap player. Otaki is an enjoyable course and while it has no creeks or swamps to lose balls in, it should not be taken lightly as it has its own unique challenges. Golf was in the doldrums ever since the economic downturn, which imposed more demands on leisure time. But times have changed. Women’s golf is looking up in Otaki, doubtless stimulated by Lydia Ko becoming world no. 1 female golfer, and interest in golf is on the rise. Club membership stands at 445, and growing. Club spirit is soaring, thanks to strong leadership, a progressive committee and some dedicated volunteers. Bella made particular mention of ‘The Friday Group’ who recently repainted the clubhouse, and the retired tradespeople who help Jamie maintain the machinery. So who plays golf on the Otaki course? 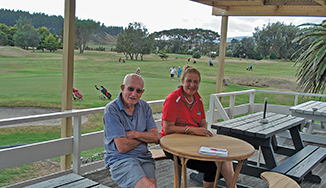 About half the golfers come from ‘outside’: Many Wellingtonians travel up the coast, lured by reasonable green fees, reliable weather and in the words of the club president “a great course, great people, and a great experience”. The wide fairways and a course playable regardless of weather conditions are an added bonus. Tom Southgate, with a golf handicap of 24 wryly commented that ‘every hole has its particular challenges’. Visiting notables have been heard to comment that ‘Otaki can bring a good player down to size’. The course record stands at 64, in the name of David James. The club is keen to attract new members: people who have never played, or those who would like to re-start. The recent Give Golf A Go campaign has attracted interest, and the Junior Programme for school kids is proving popular, where for $10 a term, every Thursday after school, with gear provided, youngsters are getting an introduction to golf. There is further incentive for youngsters to join as a Junior member for a year, at the reduced rate of $20, when they play under the guidance of an adult. Nine hole membership is popular for those who can’t spare the time for a full round of golf. It’s good for starters who want to learn the etiquette of golf, and for older people, too. Life member Fred Ferguson at the age of 93 after many years playing 18 holes, has just become a nine hole golfer, while his wife Gwen, a sprightly 90 still plays 18 holes. The club recently hosted a debate where over 100 people attended discussion on whether amalgamation with a Greater Wellington was good for Kapiti. Not only are the clubrooms capable of hosting public meetings, but the caterer has a reputation for excellent food. I asked my golfing son-in-law about Otaki. ‘A well-maintained country course’ said he. ‘The locals are really nice, the course is awesome, but it can be a challenge’. But that’s golf, isn’t it?